How Can I “Green” My Old Printer Without Putting It Out to Pasture? So, you care about the environment. But despite all the new “green” features built in to printers on the market today, you just can’t abide by the thought of trashing a perfectly functional older model just because it doesn’t boast an Energy Star compliant rating. The power-saving mode is now a printer industry standard. But fortunately, even if your older printer does not include this feature, you can still take steps at home to ensure the printer operates at peak energy efficiency — simply by turning your printer off when not in use to conserve power. And as a nice side bonus, doing so will save you a little extra money, too. 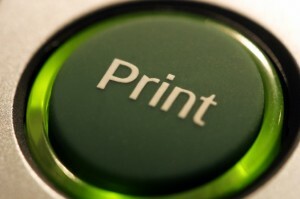 For older inkjet printers, you’re better off shutting down the printer via the power button to ensure the printer properly parks the printheads. Abruptly turning off the power to an inkjet printer does not give it a chance to apply an airtight seal to the printhead, which may cause ink to dry around the head and to blot on paper in subsequent print jobs. A graceful shutdown will also save ink. When you interrupt the power source to an inkjet printer, it will use extra ink to conduct a self-test when it comes back online. If you have an older laser printer, you can shut it off using the power button or turn off its power supply without harming the printer or using extra toner when it powers back up. You can easily turn off the printer’s power supply by either plugging the printer into a socket controlled by a wall switch or into a power strip. Then you can save power at the touch of a finger or toe. Alternatively, you can make up for your old printer’s inability to turn itself off by plugging it in via a programmable or smart power strip. A smart power strip can automatically power off the power to your printer when you turn off your PC and turn the power on when the PC is turned on. A programmable power strip can turn the printer off like a smart power strip, but you can also program it to turn the printer on when you send a print request or turn the printer on or off based on the time of day. If you use a smart or programmable power strip for an older laser printer, remember that you will still have to wait a few minutes for the printer to warm up before use. As smart or programmable as they may be, power strips can’t defeat the physical limitations of your printer. Printer expert Sean Doherty is the editor of Databazaar Blog, which covers the world of printers. Databazaar Blog is published by Databazaar, the largest independent online retailer of printer supplies. This entry was posted in Labels & Printing and tagged printing on November 2, 2010 by wlmanager.